‘Why add spreadsheet data to ArcGIS Online?’ Maybe not a typical question from a 9-year-old. But my nephew, Gio, wanted to know. He recently learned about spreadsheets in school. For homework, he was creating a spreadsheet of trees in his neighborhood. I told him I used spreadsheets to make maps. 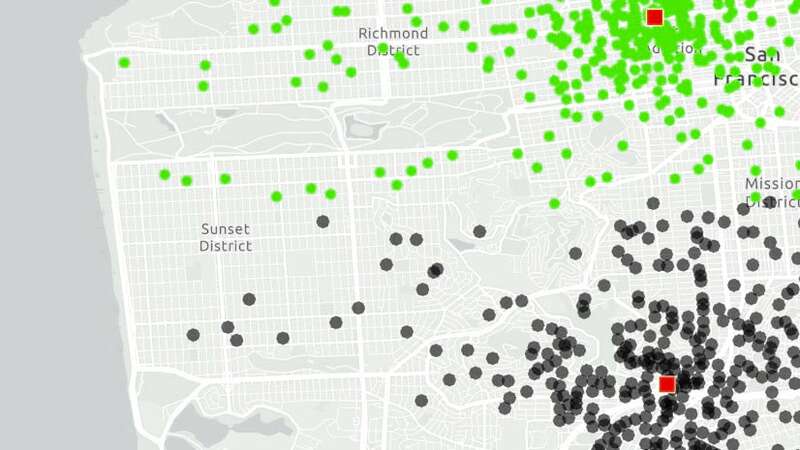 Tree data comes alive in 3D web apps. Learn how to make this app. ‘Maps are more interesting than spreadsheets. They have pictures instead of rows and columns of numbers and words.’ Exactly. Maps help you discover patterns and trends in your data because they display the data visually. For example, with Gio’s tree data, we could create 3D visualizations of the trees based on their height, species, or condition. The map could help urban planners see the tree conditions and make informed decisions about how to manage the trees. How do you get the data into a map? 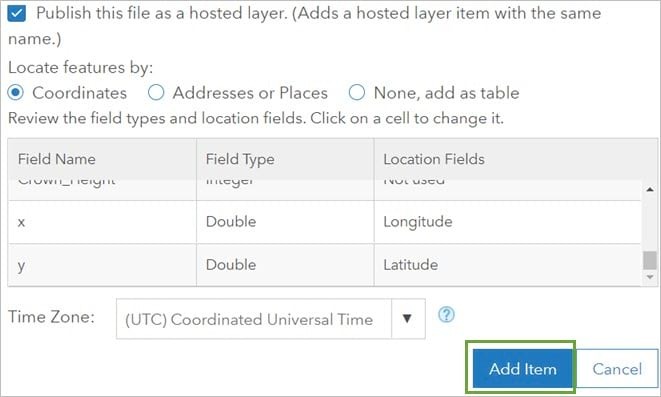 You add it to ArcGIS Online and publish it as a hosted feature layer. Hosted feature layers let you visualize, analyze, and share the data through maps. You can also update the features, edit related attribute information, and collect additional features. You can add almost any spreadsheet to ArcGIS Online if it has location information such addresses or coordinates. In 4 steps, I showed Gio how to add a spreadsheet to ArcGIS Online. Here’s how. 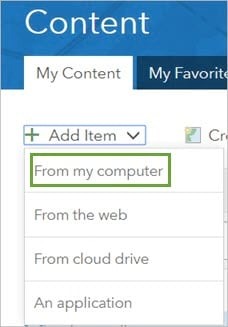 Step 1: Sign in to ArcGIS Online with your ArcGIS account and click Content. You’ll need privileges to publish hosted web layers to add data as a hosted feature layer. If you don’t have these privileges, contact your administrator or join the Learn ArcGIS organization for a free 60-day membership. Step 2: On the My Content tab, click Add Item and click From my computer. Step 3: Click Choose File and browse to the spreadsheet on your computer. 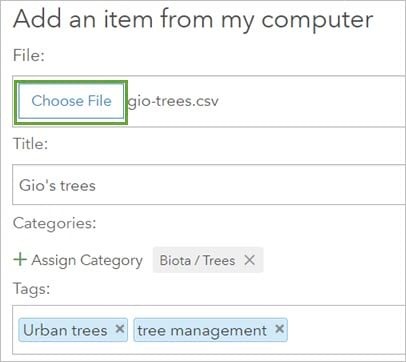 Type a title, assign a category if your organization has set up content categories, and type tags. Step 4: Leave the box checked to publish the file as a hosted feature layer and click Add Item. The spreadsheet now appears in your content as a hosted feature layer. In 4 quick steps, Gio and I added a spreadsheet data to ArcGIS Online. Gio thought this seemed OK. But maybe not quite as fun as climbing a tree. Fair enough.